Libros Schmibros, our Boyle Heights lending library and bookshop, has spent the last two months getting ready to start its life at UCLA’s Hammer Museum for a six-week Public Engagement residency, August 27- October 9. This is as formidable an enterprise as we can possibly have imagined, drawing on all our volunteer firepower as well as the return of our redoubtable board member, Catherine, to help us pull off something akin to short-order self-replication. To give you an idea of what we mean, consider this: Our shop in Boyle Heights holds about 9,000 books. About half of those needed to be packed in alphabetical order for easy unpacking in Westwood. Easy, right? Wrong! 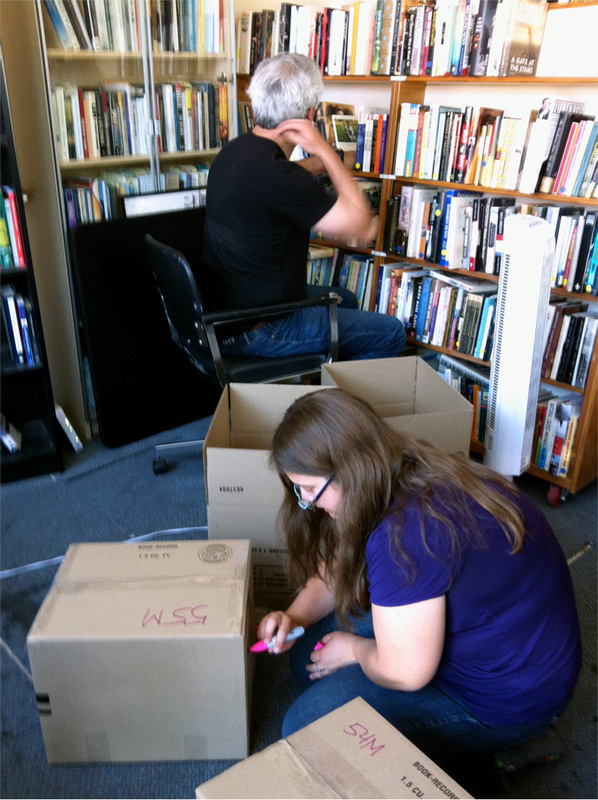 On first go round we thought we’d licked it: 90 boxes in the hold, Boyle Heights book stacks with gaps the size of ripe watermelons, staff sore and exhausted from three days of sorting and boxing. But when we did the math, we realized we were only about halfway there. The show was only a month off, and we had a world of other things to do, like get a seven-foot calavera who can read, research with our friend J. Michael Walker a 23-foot map of literary Los Angeles to be installed in the Westwood space, and dream up some Libros Schmibros banners and signs. Add to that a spectacular invitation from the Hammer to plan two events a week, half in Westwood and half in Boyle Heights and, well, you get the picture. Day by day we crossed off our to-do lists, and by August 23 had arrived at the Hammer, 5,000 books in tow, with an event calendar featuring a WPA cross-town Progressive Labor Day Trivia Quiz (play in Westwood and Boyle Heights to win! ), a marathon reading of Jack Kerouac’s On the Road, plus readings in Westwood by Boyle Heights writers, and in Boyle Heights by UCLA writers. With our August 27 opening two days away, our cross-town cell division is almost complete. We look forward to starting life again in Boyle Heights with Libros Schmibros’ grand re-opening after a two-day layoff, and here in Westwood. At 11am Saturday morning.